- Publisher This intermediate / advanced text and workbook teaches syntax as well as exegesis by means of a modified inductive approach. This intermediate / advanced text and workbook teaches syntax as well as exegesis by means of a modified inductive approach. Scott Duvall (Ph.D., Southwestern Baptist Theological Seminary) is dean of the Pruet School of Christian Studies and professor of New Testament at Ouachita Baptist University. He is the co-author with George H. Guthrie of Biblical Greek Exegesis: A Graded Approach to Learning Intermediate and Advanced Greek and with Terry G.Carter and J. Daniel Hays of the textbook Preaching God's Word: A Hands on Approach to Preparing, Developing and Delivering the Sermon and also Grasping God's Word; Dictionary of Biblical Prophecy and End Times and Journey into God's Word.. His most recent pubication is Experiencing God's Story of Life and Hope. How Can The Approach Used In This Book Help You? Why Study Greek As A Part Of Christian Life And Ministry? Preface for Teachers THE NEED FOR A NEW APPROACH If you are looking for a tool to use in teaching upper-level Greek that combines the study of syntax and diagramming with a comprehensive exegetical method, we invite you to consider Biblical Greek Exegesis. Using traditional methodology, many teachers move chapter by chapter through an upper-level grammar and have students do the exercises at the end of each chapter. The exercises normally require students to identify the syntactical function of elements within single verses pulled from different parts of the New Testament. Some teachers go a step further and supplement the grammar lesson with translation and syntax assignments from a single book of the New Testament, such as 1 John or Philippians. We are deeply grateful for such traditional approaches, and they certainly have much to commend them, but we have encountered serious pedagogical problems that limit their effectiveness with today's students. Before introducing our approach, we want to clarify what we mean when we speak of the 'pedagogical problems' associated with many traditional methods. First, traditional approaches often fail to motivate students, who tend to be more interested in understanding and applying the New Testament than in memorizing syntax categories. It usually takes several months just to cover the descriptions of the syntax possibilities, and by the end of this process students are overwhelmed with endless lists and their motivation is waning. They are disillusioned that they have yet to engage meaningfully larger portions of the New Testament in Greek---the reason they had taken the course in the first place. Second, most traditional approaches are not 'real world' in the sense of how students will engage New Testament Greek once course work is finished. Very few people who use the Greek New Testament in Christian ministry move from lists of syntax categories to the text. Rather, they begin with the text and use grammars and other reference works as tools to elucidate the text. Third, the traditional approach risks divorcing the study of syntax from the overall process of understanding and applying the message of the New Testament. Students who labor through first-year Greek are eager to see firsthand the relevance of Greek for teaching and preaching. When the study of syntax is, for all practical purposes, isolated from the larger process of exegesis, students find it difficult to make the connection, and their desire to continue the rigors of Greek language study diminishes drastically. Finally, restricting students to a micro-level analysis---focusing on words, phrases, clauses, and even sentences to the neglect of paragraphs and entire discourses---is perhaps the greatest single linguistic weakness of most contemporary approaches to teaching intermediate and advanced Greek. Even the few problems mentioned above are pedagogically paralyzing for many of today's students. Most students are willing to invest the time necessary to learn the language if (and usually only if) they can see how the study of biblical Greek connects to life and ministry. In the next section we will survey a way of teaching intermediate and advanced Greek that builds on the strengths of traditional approaches and has worked well with our students. They are learning to integrate the study of Greek syntax into the larger enterprise of New Testament exegesis and they love it! At this point you might enjoy taking a look at the Preface for Students (see pp. 14--19). THE APPROACH USED IN BIBLICAL GREEK EXEGESIS Our enthusiasm about teaching biblical Greek runs high because we have had success in the class-room. We are quick to acknowledge, however, that our success is due largely to the strength of our teaching method. Our students are willing and eager to pay the price in hours of study since they are convinced that a knowledge of Greek will help them in real-world ministry. We believe it takes more than an occasional pep talk about the relevance of Greek to convince students. As helpful as these might be (and we deliver our share of them), students need more. They need to see how the parts (such as identifying a certain kind of genitive) integrate into the larger task of moving from the ancient text to the modern audience. Our approach is intended to integrate the study of Greek into an overall exegetical method right from the beginning of intermediate Greek. We see our approach challenging and energizing our students, and we believe it will be equally motivating to students at other schools. 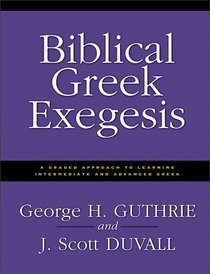 The title, Biblical Greek Exegesis: A Graded Approach to Learning Intermediate and Advanced Greek, draws attention to the two main parts of the work: Section One focuses primarily on learning intermediate (or second-year) Greek syntax along with grammatical and semantic diagramming. Section Two takes the student to the level of advanced (or third-year) Greek, incorporating their knowledge of syntax and diagramming into a comprehensive method of exegesis and exposition. Let's look first at how we approach intermediate Greek. Intermediate Greek You could label our approach a graded, modified-inductive approach. Here's how it works. In the first-year course we both use Bill Mounce's Basics of Biblical Greek. At the beginning of the second-year course, following a few class periods of orientation, students begin working in Section One of Biblical Greek Exegesis. Here we provide syntax and diagramming exercises for the following New Testament texts: 1 John 1:1--2:2; 2:28--3:10; John 15:1--27; Mark 1:1--28; Mark 8:27--9:8; Colossians 1:1--23; Matthew 6:5--34; Romans 3:21--26; 5:1--11; 8:1--17; James 1:1--21; and Philippians 1:27--2:13. These are the first nine passages in another book by Bill Mounce, A Graded Reader of Biblical Greek.